I found the patch for APEX 4.2.1 to be easy, as usual - but I've come out with one question. When in the APEX builder, keep an eye out for this region on the right hand side - if you haven't heard about a patch through the copious amounts of blogs or social media, then this is on place you might see the prompt. The patch set notes can be found here, or as part of your download. Ten minutes later, I found no errors in the apxpatch.log although the log didn't capture the final output I saw in the command display. I opened f7600.sql, found the exact location but saw no reason why the log would stop. 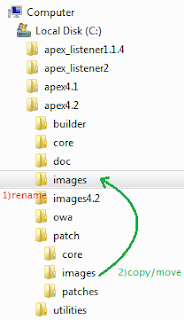 Moving on, it came to updating the images directory when using Oracle APEX Listener, and for me it got a little obscure. Ever since I can remember, this step involved copying the images folder to where the relevant web server sourced the documents, but the current documentation suggests creating a web archive. I decided not to do this in my circumstance - stand alone APEX listener, with no WLS/Glassfish because the documentation for this option didn't require it. Then dragged /images from the patch folder to my apex4.2 directory. 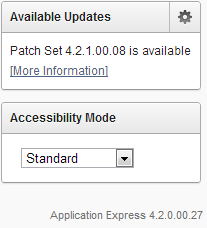 I also checked my older post regarding APEX 4.1 upgrade to see if there was something I missed. Opening the localhost:8080/i/apex_version.txt showed the patched version, so no harm done? My question - under what circumstances would you need to create the web archive - and what advantage/functionality does it provide? It will also pay to read notes regarding jQuery Mobile 1.2.0, which is part of this patch - there are some interesting widgets to play with. Now I very much look forward to the new year, upgrading my current client from 4.1 so we can start a project building an application for a tablet. Thanks - now that my SQL*Plus session has been terminated, I now see the complete listing.